My favorite quilt on the internet this week is Diamond Derby, which I found in the Fresh Modern Quilts group on Flickr. I love me some orange and teal. 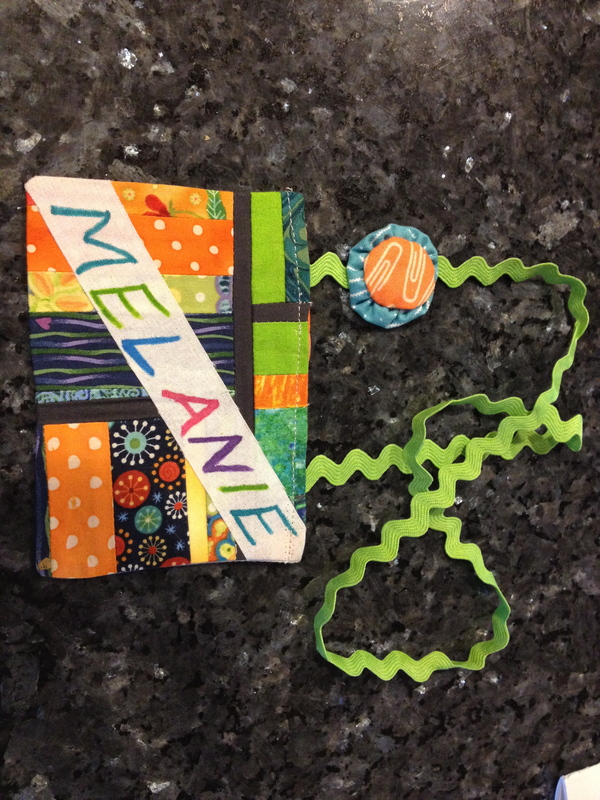 Also, I made a tiny, tiny quilt for a nametag project for last night’s meeting of the North New Jersey Modern Quilt Guild. A lot of the women embroidered the names of their partners, but I don’t share that skill yet, so I was so lucky to find this typewriter key pattern that I could piece together. The squares were one inch before piecing. Also, binding such a small project was tricky, so I ended up with a blob of thread in the corner. That’s when I consulted the bead section of the craft store and made it really fancy. I think Peggy liked it– it matched her outfit perfectly! I love mine too! It was inspired by my love of Elizabeth Hartman’s work. Thanks Peggy. Coincidentally, it matched my outfit. In addition to solo parenting this week, I also had to bake five dozen muffins for a party for Eli’s school on Tuesday (AND chaperone a school trip to the zoo on Wednesday, but that’s not really relevant to more than my frazzled exhaustion). I had been on the lookout for a healthy oatmeal banana recipe, and magically, as if I willed it into being, it appeared on Nat the Fat Rat. It is not only super easy, it’s also sugar, flour and egg-free. It was a big success. They are dense and flavorful and a perfect breakfast or snack. I was able to make 60 in just a couple hours. 2 1/2 cups raw oats, 1 cup sour cream, 1/4 cup honey, 2 ripe bananas, 1 tsp vanilla, 1 tsp baking soda, chocolate chips to taste. Mix and bake at 400 degrees for 15 minutes. I’m not too familiar with Ok Go’s music beyond the brilliant treadmill video and impressive marching band one, but their Pandora station is fantastic. It has given me Arctic Monkeys, Weezer, Death Cab For Cutie, White Stripes, Smashing Pumpkins, Edward Sharpe and the Magnetic Zeros, Spoon and the song below, “Where is my mind” by Pixies. It came on at the perfect moment yesterday, as my coffee had just kicked in, and I actually saw my two-year-old bobbing his head to the beat in approval. It’s a moment that somehow froze and preserved itself in my memory, backed by that echoing guitar twang. 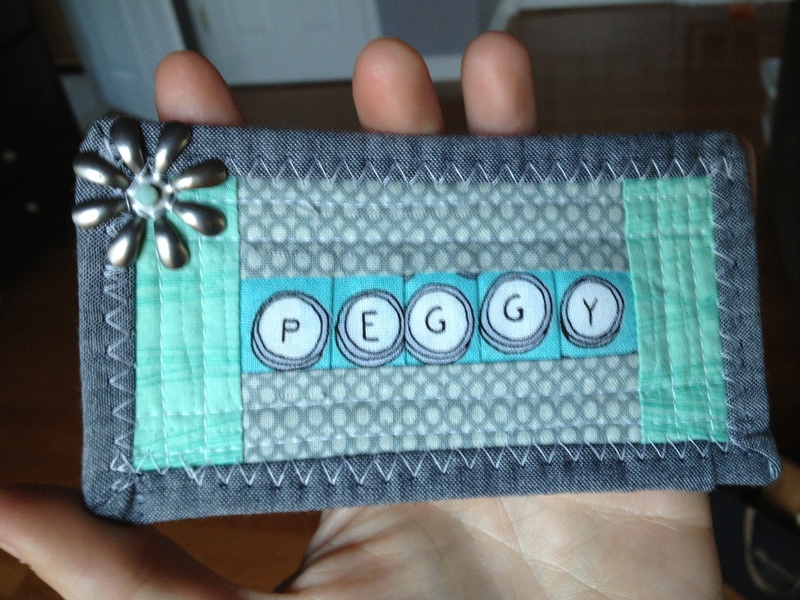 I’m still seriously obsessed with the nametag you made Peggy – completely adorable! See you soon! Thanks! Looking forward to a few fun days of quilting coming up.